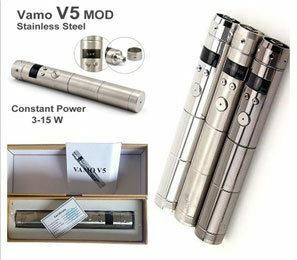 Currently we are out of stock for Vamo V5 please consider buying Vamo V7 as it comes with full package including batteries, tank and charger. So what’s new compared to previous versions? The Vamo V5 uses the body style of the Vamo 2 which is cool. The Vamo 3 introduced some great electronic and a new OLED screen, but the body was weird with these stripped swirly lines. For whatever reason we skipped a Version 4 and went straight to the Vamo V5. So essentially V5 is a Vamo 2 body with Vamo 3 electronic. There is also a removable top that makes it easy to get ego mods on and off.